The Mountain Rose Inn is delighted to present "A Weekend of Scottish Fiddling" November 6-8 with Master Fiddler Dr. John Turner. Dr. Turner, the only ten-time winner on record of a National Scottish Fiddling Championship, has played a major role in the revival of interest in traditional Scottish fiddle music over the last three decades. As a recording artist, he is featured on seventeen recordings. On stage, radio and television, Turner has performed throughout the U.S., Canada, the U.K., Japan and the Middle East. He has performed for six U.S. presidents, Queen Elizabeth II, other members of Britain’s royal family and many other heads of state from around the world. He is the founder and director of the Jink and Diddle School of Scottish Fiddling, now in its twenty- sixth season. He performs regularly in Williamsburg, Virginia and across the U.S., teaches privately, conducts workshops and serves as an adjudicator for fiddling competitions. This weekend of music at the Inn will begin on Friday evening, Nov 6, with a fireside three-course dinner in the Dining Room. 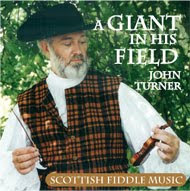 Afterwards, Dr. Turner will present a concert, An Evening with John Turner, Scottish Fiddler, in the Inn's parlor. On Saturday, following the Inn's four-course breakfast, Dr. Turner will present the morning lecture A Brief History of Scottish Fiddling. Lunch will be served, and then Dr. Turner will present the afternoon lecture Scotland and Virginia in the 18th Century. There is plenty time on Saturday afternoon for viewing the fall foliage and enjoying dinner at one of the fine dining establishments in the area. Dr. Turner will give a brief concert, New Tunes in the Traditional Scottish Style - Compositions by John Turner and/or His Student, on Saturday evening. Package includes two nights lodging, Friday's dinner and concert, Saturday's lectures, music events, and lunch, and of course, breakfast on both mornings. Package price per couple for queen bedded rooms is $880 and for king bedded rooms is $920. Make your reservations today.